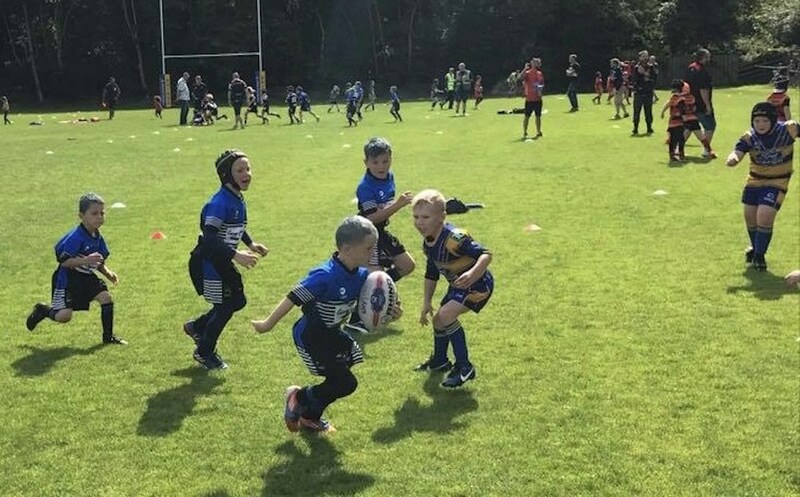 Here’s another entry for the 2019 St Luke’s CARES Community Awards, it has been submitted by Pat Benatmane on behalf of Hunslet Green, the home of the Hunslet Warriors ARLFC. For details of how YOUR community group can enter please click here. Hunslet Green, next to Morrisons in Hunslet, looks after a clubhouse and pitches used by over 200 children and adults. We welcome all ages to come along and enjoy the camaraderie and healthy, if sometimes muddy, exercise. In an area of social and economic deprivation, we aim to keep costs to families as low as possible and help to instil a healthy lifestyle. Team building is another important aspect of our volunteers’ work, along with a respect for the local facilities. Keeping youngsters active and involved helps keep them away from more unsavoury pursuits. Many of our youngsters progress through the age groups to the Open Age team. Some have turned professional, such as Liam Sutcliffe and Mikolaj Oledzki. The latter, Polish-born player, decided to try rugby league when he was 14 years old and chose the Warriors to teach and guide him. We have a girls’ team and previous members have played for Yorkshire. Our constitution encourages equal opportunities through inclusiveness – of gender, ability, age, religion, race and sexual orientation. Training for different age groups takes place Monday to Thursdays, with matches usually played on Saturdays and Sundays. Spectators of all ages are welcome. Social events are organised for the clubhouse in order to help pay the bills. There is one paid member of staff to run the bar area – our main funding resource – and all others are volunteers, whether on a committee, a coach, a litter picker, a grass cutter, a physio or a team manager or any of the many other jobs involved in running a successful club. The community of Belle Isle, Hunslet and Beeston give their time willingly. We now have two pitches which we maintain ourselves. These need regular maintenance. Any award we gain would go towards the cost of fertiliser, grass seed and a new lawnmower. Our present one, bought second hand, is beginning to show its age. It has improved our pitches greatly as it can pull a roller or a scarifyer as well as cutting the grass each week before matches. As the volunteer secretary for Hunslet Green, I know how tight funds are and how wisely they are spent. All money is used to benefit the members and players. With the new season and springtime coming close, we shall be relying on our mower but wonder how long we can patch it up. We hope you will vote for us. Come down and see us one weekend or training night. Bring your kids and let them run off some boisterous energy whilst learning new skills. New members are always welcome. One of the many great groups we have in South Leeds, supporting people of all ages.